Podere Casanova is a small, family-run holiday estate in the Chianti countryside just 20 km from Florence. Here you'll find tastefully furnished and fully accessorized apartments that are the perfect base from which to set out to explore Tuscany. The wide open spaces of the estate surround guests with peace and tranquility, with a beautiful view over the surrounding valley. As a guest, you will be able to relax by the swimming pool or put Lisa's tips to the test as you plan and enjoy trips to Florence, Siena and the nearby countryside. The warm hospitality Lisa and her family offer at Podere Casanova is what makes everyone who arrives here feel as if they've come to visit lifetime friends. A fun, entertaining evening where everyone can spend time together and discover lots of ways to prepare pizza. Podere Casanova is a splendid Italian farmhouse dating back to the 17th century sitting among the green hills of the Florentine Chianti countryside. Upon your arrival, you'll be enchanted by the panoramic views of the countryside as well as by the kindness and friendliness of the owners, who personally manage the farmhouse and are attentive to meeting all of your needs. Each of the apartments has its own kitchen and everything necessary for preparing your own tasty meals when you feel like dining in. If you visit Podere Casanova between April and October, be prepared for a special treat: as part of the special welcome, the family organizes a free, delicious dinner buffet on Saturdays where you'll be able to sample regional specialities as well as some family favorites. During the same period, guests can take part of another weekly ritual: the Pizza Party on Wednesday! Spend time with other guests and the family with homemade, freshly baked pizza. Children love becoming cooks for the night and preparing pizzas for their families, delighted to eat their own creations. All of the apartments at Podere Casanova are simply but tastefully furnished. They each have their own fully equipped kitchens where you can prepare your own meals, as well as an outdoor private area (either a terrace or part of the garden) that has a table, chairs and barbecue grill, perfect for outdoor cooking in nice weather. The apartments, each with its own separate entrance, can host from 2 to 6 people. Two sets of apartments can also be rented together, offering space for up to 8 or 9 guests, which would be perfect for two families or groups of friends traveling together. One of the most popular areas at the Podere Casanova is the swimming pool, the ideal place to hang out during the warm summer months as well as in the evenings while savoring a glass of wine and enjoying the view. Children love spending time at Podere Casanova: the wide open spaces and large meadow by the pool are perfect for running and playing around, but the children's playground is a definite attraction. They also enjoy feeding the farm's small, friendly goats! In addition to activities offered at Podere Casanova, there are also many others to enjoy nearby, from cooking classes, wine tastings, a few rounds of golf, tennis courts for friendly matches or offroad tracks for mountain biking. Just ask Lisa and she'll provide information on what is available and where to go. Podere Casanova is in the hills of the town of Montespertoli, a small charming town in the Chianti region near Florence famouse above all for its excellent wines and olive oil. Its central location in the region makes is ideal for a base from which to set out to explore the area, from visiting Florence, San Gimignano, Siena, Lucca and Pisa as well as smaller villages that might not be as well known. 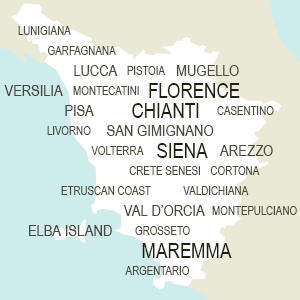 Lisa offers a great week-long itinerary for visiting the region on Podere Casanova's website. Don't wait any longer, go ahead and see what Lisa suggests for planning your vacation in Tuscany.... and book your stay at Podere Casanova! At Podere Casanova, you'll also meet my large, beautiful family which includes my husband Tommaso, my sister Lara, parents Biagio and Maria, and my two children Niccolò and Margherita. Contact us for this offer!